A newly described relative of Tyrannosaurus rex is the largest known feathered anima. The feathered meat-eating dinosaur lived about 125 million years ago. This group of dinosaurs is known as the Tyrannosauroids. Tyrannosaurus rex and its gigantic cousins lived until around 65 million years ago. Xing Xu and colleagues from the Chinese Academy of Sciences in Beijing have now described three specimens of Yutyrannus, which represents an early example of the Tyrannosauroid form. The three 125-million-year-old specimens were collected from a single quarry in Cretaceous-era rocks in northeastern China’s Liaoning Province. The region is where other famed feathered dinosaurs. The researchers estimate that the adult Yutyrannus would have measured about 30 feet (9 meters) long and weighed about 1.5 tons (1,400 kilograms). That makes it only about a fifth to a sixth the weight of its infamous cousin Tyrannosaurus rex, but some 40 times heavier than the largest previously known feathered dinosaur. The fossilized feathers, which range from about 6 to 8 inches (15 to 20 centimeters) long, were preserved in patches on different parts of the three fossils, leading the scientists to speculate that Yutyrannus’s entire body was probably covered in feathers. According to paleontologists the creature’s large size and the primitive state of its feathers rule out the possibility of flight. 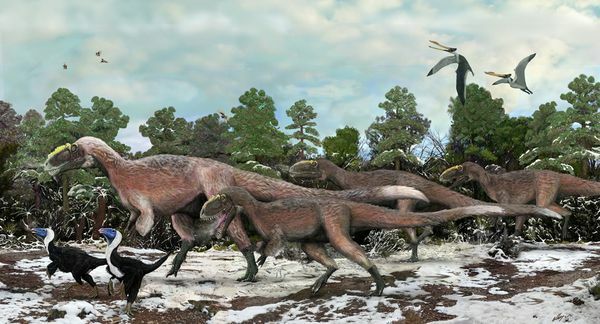 Instead, the downy covering may have helped keep Yutyrannus warm. The scientists think the long, filament-like feathers would have acted as insulation, but they cannot rule out the possibility that they were also used for display in mating or fighting rituals.